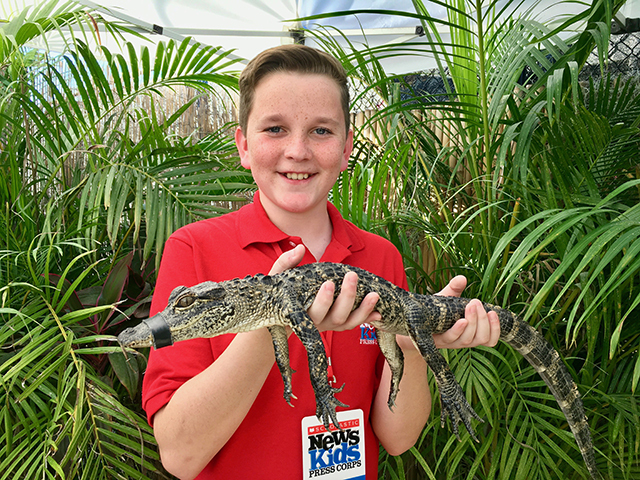 A Visit to the Everglades | Kid Reporters' Notebook | Scholastic Inc.
Ryan holds an alligator at Everglades Holiday Park in Fort Lauderdale, Florida. The Florida Everglades is home to more than 70 threatened or endangered species. People sometimes describe the Everglades as a swamp. It is actually the largest subtropical ecosystem in North America. I recently took an airboat ride through Everglades Holiday Park in Fort Lauderdale, Florida, to learn more about the Everglades and the animals that find refuge there. The 1.5-million-acre wetlands preserve stretches across the southern tip of Florida, from the Kissimmee River to Lake Okeechobee. Hundreds of animal species can be found in the Everglades, including raccoons, skunks, bobcats, and white-tailed deer. The Everglades is also home to exotic birds, snakes, and reptiles. The ecosystem has one of the world’s largest populations of vultures and more than 200 different types of fish. Decades ago, hunting decimated the population of American alligators. In 1973, the animal was listed as an endangered species. Today, the American alligator is making a strong comeback. Martin attributes that to stricter hunting laws. “Now, the hunting season is controlled to just two months a year, which has really helped,” Martin said. In 1986, the animal was removed from the endangered species list. In Florida, licensed trappers don’t charge a fee for taking away nuisance alligators. But they don’t have many choices about what to do with them. “Alligators that are trapped and measure over 4 feet long must, by law, be destroyed or go into captivity,” Bedard said. That results in about 7,000 nuisance alligators being killed each year. Bedard wants to protect American alligators. He deliver the ones that he rescues to the sanctuary at Everglades Holiday Park, where he educates crowds during a live Gator Show almost every day. The program features some of the nearly 100 gators that he has helped to save. Bedard also takes his conservation message to larger audiences. He is one of the stars of Gator Boys Alligator Rescue, a hit TV show on Animal Planet. But the animal expert cautioned that construction could upset the balance. “We need to stop building into the alligators’ environment,” he added.